Car accidents happen, but luckily you've had a choice for decades on whether to repair your car with generic car parts or with car companies' parts, a choice that saves consumers approximately $1.5 billion a year. However, big car companies are now trying to make you buy car parts exclusively from them by placing a 14-year design patent on replacements parts, such as fenders, grilles, headlights, and mirrors. Giving the car companies even more control over a market they already nearly monopolize. What is the PARTS Act? In April 2017, U.S. Representatives Darrell Issa (R-CA) and Zoe Lofgren (D-CA) and U.S. Senators Orrin Hatch (R-UT) and Sheldon Whitehouse (D-RI) reintroduced the bipartisan, bicameral Promoting Automotive Repair, Trade, and Sales Act or the PARTS Act (H.R. 1879 and S. 812), which strikes a balance between protecting intellectual property and preserving competition in the automotive repairs parts market. Similar legislation was introduced in the 114th Congress. This pro-consumer, pro-competition bill would reduce the period during which car companies can enforce their U.S. design patents on collision repair parts against alternative suppliers for selling such parts from 14 years to 30 months. The enforcement period would begin the day a model containing the design patented parts is first offered for sale in any country. During the 30-month period, alternative suppliers could manufacture, test, market and distribute parts pre-sale without infringing on the design patents. Since car companies compete on sales, partly based on how their cars look, this legislation would not affect their ability to enforce design patents against each other. 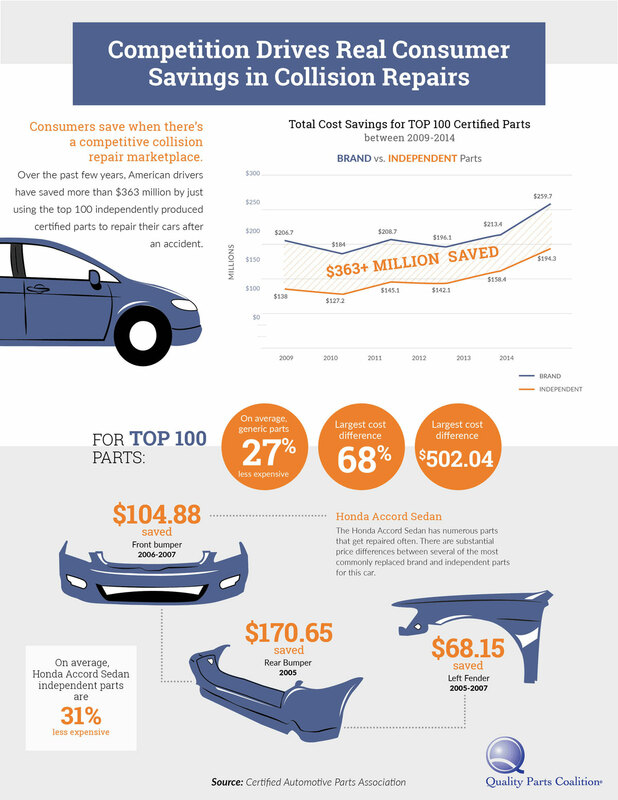 by keeping costs down and preserving access to alternative, lower-priced, high quality auto parts. by ensuring availability of quality, low cost parts at more than 40,000 collision repair shops nationwide. by preserving 60 years of competition and stopping the car companies from growing their monopoly at your expense. by bringing the U.S in line with other countries, including the EU and Australia, who have similar laws. Major car companies control more than 66% of the collision repair parts market, and they are trying to expand their monopoly by securing U.S. design patents on collision parts like bumper covers, hoods and mirrors. By enforcing design patents on seven collision repair parts for the 2004 Ford F-150, Ford effectively eliminated competition for seven F-150 collision repair parts. 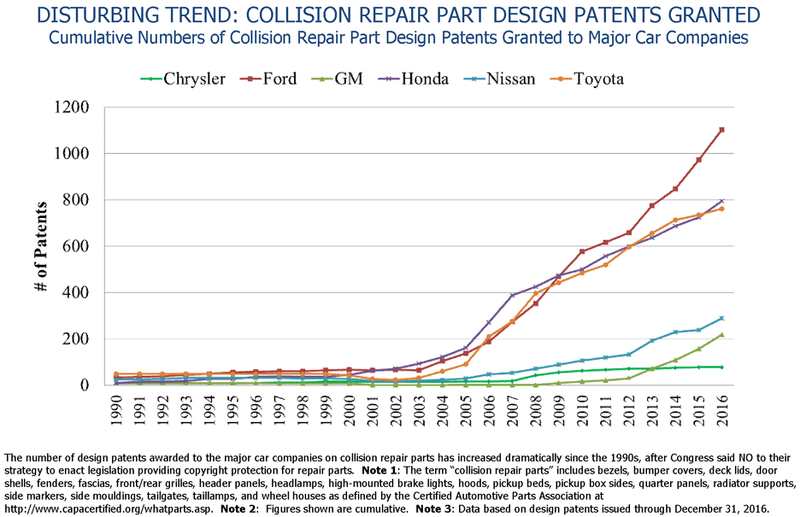 Dramatically increasing since the 1990s and more than doubling since 2005, the design patent problem will only worsen as more car companies seek to expand their monopoly in the market. What does this mean for American motorists? The ability to choose alternative collision repair parts currently saves consumers approximately $1.5 billion each year. These parts – while equivalent in quality – are often priced 26-50 percent less. If the car companies are allowed to use design patents to eliminate competition for collision repair parts, American car owners will be left with very limited options. What is an alternative collision repair part? Are these ‘aftermarket’ parts high quality and safe? The quality is assured by manufacturers and distributors who provide warranties on their parts. QPC members often have warranties that exceed those offered by the car companies. Many quality alternative parts are certified by an independent third party. The Quality Parts Coalition Announces the Release of the White Paper Written by Distinguished Intellectual Property Law Professor, Joshua Sarnoff, of DePaul University College of Law. The White Paper Supports the Passing of the PARTS Act. The Quality Parts Coalition (QPC) represents the interests of the independent parts industry, repairers, insurers, consumers and seniors. The Coalition consists of associations, coalitions and businesses committed to preserving competition in the collision parts industry. The goal of the QPC is to develop and secure a permanent legislative change to U.S. design patent law to protect the consumer’s right to benefit from quality, lower-cost alternative replacement parts and to preserve competition. We believe competition is good for everyone and we are fighting every day for consumers’ right to have a choice. That is why we are supporting the Promoting Automotive Repair, Trade, and Sales Act or the PARTS Act. Support the PARTS Act Today! Help keep auto parts affordable.